The Entrance Examination fee is to be paid through Paytm OR Demand Draft (DD) of Rs. 1,500/- and Rs. 500/- for SC/ST candidates only, issued from any nationalized bank, in favour of “AKU, REGISTRATION AND EXAMINATION FUND” payable at Patna before offline registration. CAREFULLY READ THE INSTRUCTIONS GIVEN ON THE FORM FOR FILLING THE REGISTRATION FORM. Please fill all the required information(fields) asked on the form. After filling the form, send the form duly supported with the attested photo copies of the documents required as mentioned in the Prospectus and Paytm eReceipt OR Demand Draft(DD)[write your name, mobile no. 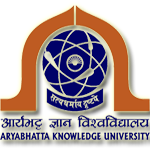 at the back of the e-Receipt/DD] must reach to: To, The Controller of Examination, Aryabhatta Knowledge University, Mithapur, Patna – 800 001 . (Bihar) on or before the last date for receipt of the form through Speed post/Registered post/ by hand in one sealed Envelope. CLICK ON THIS LINK TO DOWNLOAD THE REGISTRATION FORM- M.Ed.